Imagine 50 yard line seats at the Superbowl. Floor seats at an NBA Championship, or behind the dugout at the World Series! Find that hard to envision? What about front-row seats at one of the world’s top yacht racing events: the Congressional Cup! The Congressional Cup is one of the leading match racing events in the sport, bringing top talent from around the globe to contend in thrilling one-on-one bouts on the water. 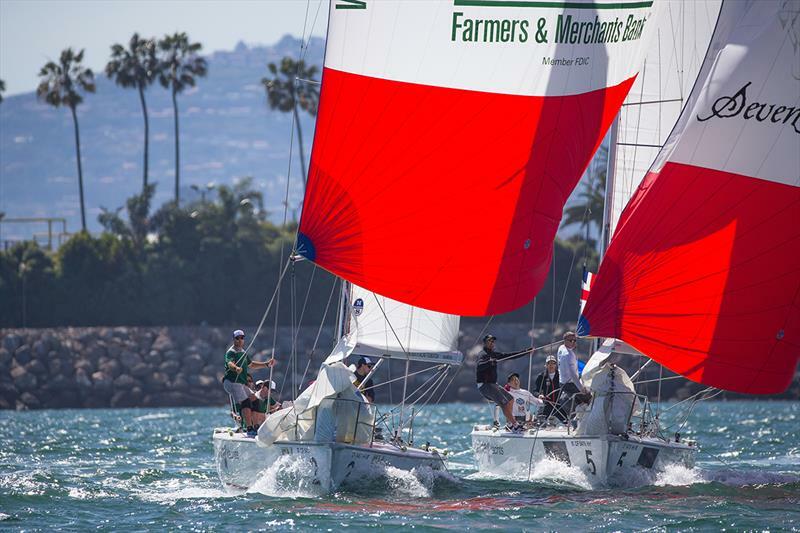 This prestigious Grade One Match Racing regatta, hosted by Long Beach Yacht Club since 1965, returns to Long Beach April 3 to 7, 2019. Top-ranked skippers and their teams vie in double round robins aboard one-design Catalina 37s; squaring off against each rival twice, with the lucky frontrunners advancing into semi-finals and finals. 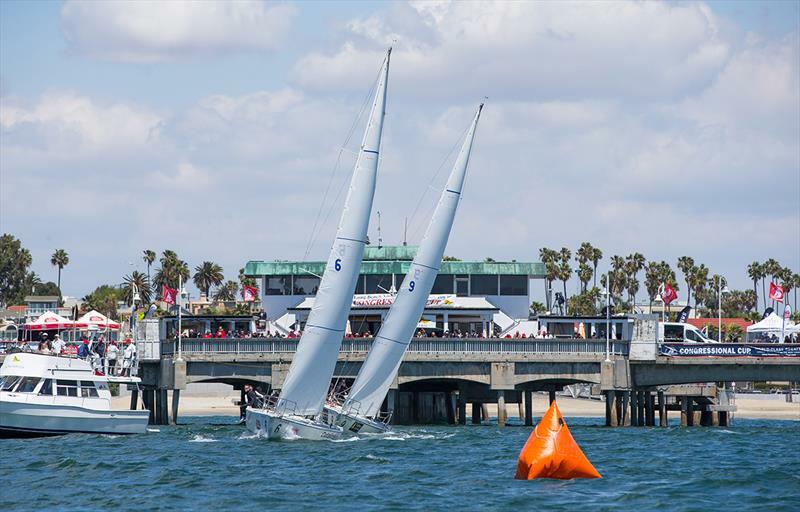 This exciting competition takes place directly off the Long Beach Belmont Veterans Memorial Pier, where spectators can enjoy the action and commentary Free of charge from 11:30AM to 5PM daily, April 3 to 7. Compelling and insightful play-by-play will be announced by none other than pro TV personality Tucker Thompson, official Host of the 35th America’s Cup. Thompson, a former champion sailor and TV host and producer, will be joined by special guests to emcee five days of Congressional Cup action, live from the heart of the race. The event is pure excitement, as competitors race so close to the pier, spectators can practically reach out and touch the sails. Commentators explain the ins and outs of match racing, each skipper’s maneuvers, and umpires’ calls. There will also be music and entertainment, refreshments, bleachers, and an enthusiastic crowd of fellow boaters who convene from far and wide to enjoy the spectacle. Enjoy this free premier racing experience at Belmont Veterans Memorial Pier, 15 39th Place in Long Beach, CA, where fans will find convenient parking and full facilities. Can’t make it to the waterfront? Friday April 5 through Sunday April 7, Long Beach Yacht Club will offer live-streaming coverage and features to viewers around the globe on Facebook and the event website. Nightly press conferences relevant to the day’s racing, and always entertaining will also be live-streamed, starting Wednesday April 3, at approximately 5:30pm. 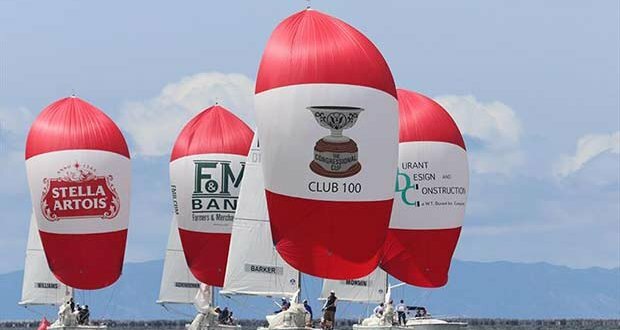 Who will win the prestigious Congressional Cup trophy and Crimson Blazer an honor bestowed on sailing greats such as Dennis Conner, Dean Barker, Ken Read, Ted Turner and defending champion Taylor Canfield? Follow on Facebook @CongressionalCup or visit www.thecongressionalcup.com.